and now for something completely different…the skit guys! I’m nominating Tommy Woodard and Eddie James for beatification! Okay, they’re still alive so it’s a tad premature. But The Skit Guys are doing more for evangelization than many a dour or sober preacher on a Sunday morning. Or the door to door missionaries that show up at our house. In the case of the former, I usually zone out and wait for the agony to be over. In the case of the latter, I hide behind closed curtains to avoid their offer to save my doomed soul. But when I watch a Skit Guys video, I’m happy to put my work aside and give them my time and attention. Okay, I give them more time than I should. I challenge you to watch only one video! They have been best friends since high school. Think of them as the wise guys in class who had everyone laughing and managed to make a career out of it. They’ve been teaching God’s word using comedy, drama and whatever category talking action figures fit into for over twenty years. I’m a big fan of comedy and laughter, especially with things religious. James Martin, SJ explored this so well in his book, Between Heaven and Mirth. I also believe that you catch more flies with honey. It’s so much kinder and gentler than offering fear of damnation or a sponge full of vinegar on a stick. Misery seldom draws a soul to God. I love when the right book falls in my lap at the right time. Thanks to technology, it can fall in my lap quicker than ever before. 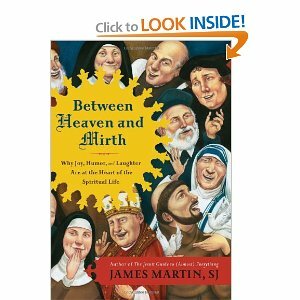 And so it was with Between Heaven and Mirth: Why Joy, Humor and Laughter are at the heart of the Spiritual Life by James Martin, SJ. No sooner had I read the book review in the Prairie Messenger, I knew I had to get a copy. A quick search on Amazon, a click of a button, and I had it uploaded to my iPad. Anyone who promotes the use of joy and cheer in our often joyless and cheerless religions has my vote. Martin shows the presence of joy and humor throughout the bible. Accustomed as we are to seeking deep and heavy scriptural meanings, it`s wonderful to see well-known stories through a new light. A light that shines on the silly, the absurd, and down-right comic. I always believed that God has a sense of humor. Martin also believes that God wants us to share in the joke. He challenges those who work within our religious institutions to lighten up. I agree wholeheartedly. Nothing is a bigger turn off for me than the overly pious soul who does their work as if the weight of the church rests on their shoulders. Doom and gloom ministers, whether pastors or parish workers, are a turn-off. Who wants to join their depressing brigade? Give me a community of souls with a sense of humor. Give me a meeting where laughter lightens the load of the tasks before us, where no one takes oneself too seriously. Give me family and friends with whom I can share a good meal, a bottle (or two) of wine, and joyous conversation. Now that, my friends, is a touch of heaven!